Monday, Monday. Can't trust that day. Well, here we are again. The Dell has been shipped to Texas where they'll hopefully fix it this time. I am hopeful. Great weekend, starting with a birthday dinner for a friend. We went to Mockingbird, a cute, hip little place downtown. I ate the barbacoa over grits and chard. YUM. Saturday, we hit the ground running. I took Piper for her vet visit - and she's healthy for another go-round the sun. And they love my girl. Who wouldn't? After we got Piper squared away, Matt and I went south of town to run an errand for him, then one for me - then I did my weekly Aldi run. I found a table there that I kind of want - it would replace a fairly non-sturdy piece that I don't love. We'll see. If it's there next week, I'm taking it home. Saturday night, I cooked a corned beef, a bunch of roasted carrots and Brussels sprouts, potatoes, and soda bread. We ate late, but it was so tasty. Sunday, I did not hit the ground running. I slept way, way in and slogged out of bed. We went down to McKay's, where I found a book that I read as a kid and loved. I wouldn't mind having a copy of it, and its companion books - they're by Cynthia Voigt - about the Tillerman Family - this one is told from the point of view of Dicey's friend, Mina Smiths. She's fascinating - she and Dicey are both really strong, well written female characters. As is Abigail Tillerman - Dicey's grandmother. The other female character in the series is Maybeth. She is not strong in the same way that the other three are. She is learning disabled, and struggles with real world matters. But she is the emotional core of her siblings. She is beautiful, and sings well, and cooks and generally is a care-taker. You get the feeling that she will be fine. She's really the one character who doesn't have a book from her point of view. Hmmm. That might be interesting. Cynthia - if you're reading this... give a girl a break! After McKays, we had lunch, did a quick stop at Costco, and came home. I got dressed and drove to Madison for a session of goat yoga. Only, here's the thing. I registered for a class at 4:30 on Sunday... the 25th. Sooooo, there was the last class of the day leaving, and I was showing up all ready to go for a session that didn't exist. 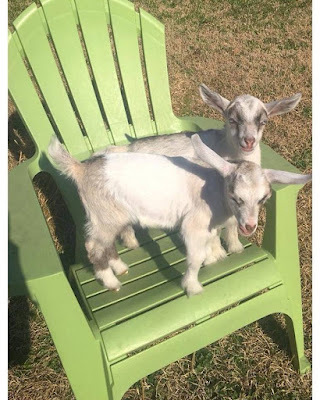 I figured out my error and the instructor and I talked for a little bit - then she said, "Well, would you like to see the goats?" Well, I mean, hell yeah. I love the goats. I like yoga OK - but it's about the goats. The owner and I talked for a minute, and then she handed me one of the newest babies, a little white bundle with a pink mouth. This is Holly and her twin, Minx. Holly. Holly was fluffy, and smelled like grass and baby shampoo and sunshine, and she was warm and snuggly. I held her for a good five minutes before I realized I should let them get the goats back into their crates to head to the farm. I thanked the instructor and owner and told them I would see them next week. If you try sometimes, you just might find you get what you need. I needed that goat. Oh, man - did I need that goat. Baby animals are just about the best thing in the world. Human babies are OK, but they always look like raw hamburger meat to me. At least for the first few days. Anyway, after my goat hugging session, I finished up a little shopping for the week, and I came home. Cooked supper last night, watched TV and looked through catalogs, and then we called it a weekend. And now it's Monday. I'm still struggling a little with waking up early, but it gets easier each day. By July, I should be all set. The news of the day is weather. Bad weather, and lots of it headed our way. I hope it ends up being nothing, but I think we know that's unlikely. And with that, I'm going to dive back into my day.